There‘s a new supercar coming from a company called VŪHL, and it’s called the VŪHL 05. Don’t know anything about it other than the body will be made in Canada and final production will be in Mexico City with the brand‘s “European arm” (whatever that means) headquarters calling Luxembourg home. Parts are coming from a who’s–who of brands like Ford, Magna Steyr and Multimatic. The name VŪHL stands for “Vehicles of Ultra-Lightweight and High-Performance“. The brand was created by the brothers Iker and Guillermo Echeverria with financial backing from the Mexican Government. Government hands in the creation of a supercar is never a very good idea, but I am awaiting the VŪHL 05’s 2013 Goodwood Festival of Speed debut with cautious interest. VŪHL – remember the name. It is that of a highly specialist vehicle manufacturer that’s about to sprint from the shadows. The company’s first product, the VŪHL 05, is a road-legal lightweight supercar that’s been precision-engineered for the track and endowed with exhilarating performance. It will be launched at this year’s Goodwood Festival of Speed, UK, July 11-14 and bring a breath of fresh air to the premium track-day sector. While VŪHL has been a well preserved secret (until now), its inventory of renowned suppliers and development partners reads like an international who’s who of the performance car industry, and includes: Magna Steyr, Multimatic, Ford and more. Embodying the ultimate in automotive technology from around the world, the newcomer’s handling was optimised in the UK, while its bodies will be fabricated in Canada, and the chassis production and final assembly conducted by the advanced manufacturing concern Adman Leku in Mexico City. VŪHL’s European arm is headquartered in Luxembourg. VŪHL (the name is pronounced ‘vool’ and stands for ‘Vehicles of Ultra- lightweight and High-performance) is the brainchild of brothers Iker and Guillermo Echeverria, whose Mexican/American design agency, Etxe, penned the breath-taking 05. Their profound passion for all things automotive grew from a hands-on role in the GT and formula racing cars successfully built and campaigned over a 30-year period by their father, Guillermo Echeverria senior. The company’s blue-chip backers include private investors and the Mexican Government. 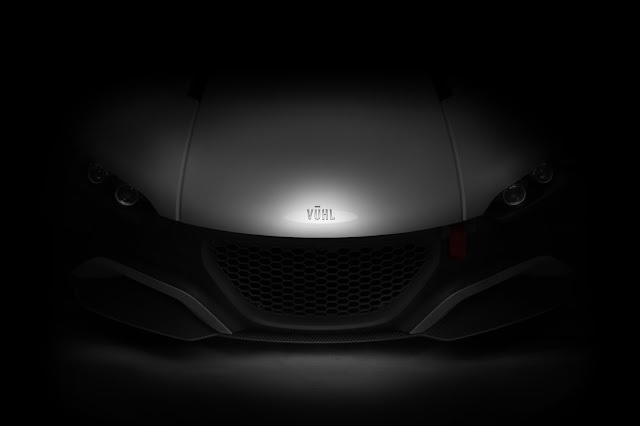 Further details of the exciting VŪHL 05 will be released very soon – see www.VUHL05.com for regular updates.